I confess that my heart sinks at doorstop books, though I think that might be changing with the e-reader. No painful thumbs, for instance. But mostly the pain is psychological! Once I start I have to finish as quickly as possible however. Given the size of The Goldfinch I think a preparatory trip to the gym might be needed just to hold it up! Perhaps the advent of the e-reader means books will get even longer. Well I actually got up half an hour earlier for a week to read The Luminaries and was about 500 pages in when it was announced the winner, because a book like that must otherwise wait for the summer as Murakami’s 1Q84 did last year and b>Chimamanda Ngozi Adichie’s Americanah did this year. My best reading buddy is finishing The Signature of All Things as we speak, and she is on a train heading for Monet’s Gardens in Giverny, so I have a week or so to wait before it lands on my bedside table. 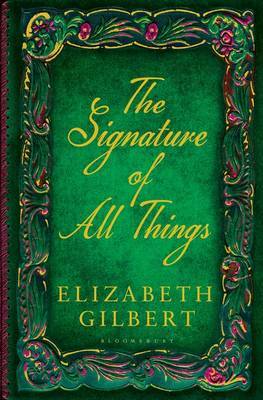 But I couldn’t help but notice that she speaking at the Southbank Centre in London tonight and there is a wonderful trailer on their website where Elizabeth Gilbert speaks about her inspiration behind the book and the main character. Wow, it really works in making you want to start reading immediately. You can view the trailer here. Makes me wonder if it too is destined for a film. I like your doorstep strategy! There seems to be something of a trend in expanding size – perhaps more publishers could go the 1Q84 route and publish in separate volumes. It would save those aching arms. Thanks for the link – I liked the way she spoke about Alma. She’s such a complex and ultimately endearing character. I think she will stay with me for some time. Hope your reading buddy enjoys the book as much as I did. As she was speaking about Alma, I suspected she was going to say that there was a link with her own obsession, what a fascinating connection back to an historic book that has been in the family for so many years. My reading buddy teaches and therefore reads a lot of creative non-fiction, so she tells me she is absolutely loving both being within the pages of a novel and this one is pushing all the right buttons. Sharing a great novel is half the fun! Can’t wait to read it. She blends her research into her fiction beautifully, none of that clunky ‘I’ve spent hours in the library so it’s going in’ stuff. Hope you enjoy it, Claire. Thank you and you’re absolutely right – it very much depends on the book. I think it also depends on how well it’s been edited.